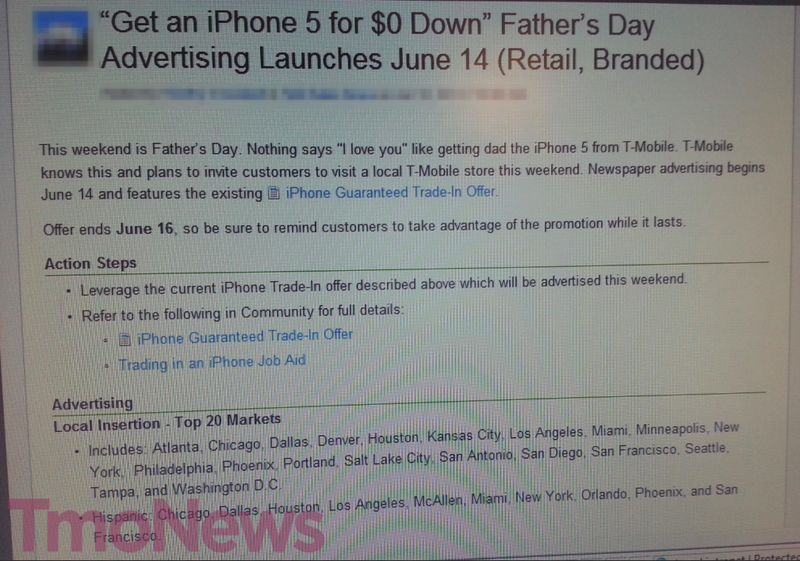 T-Mobile’s Father’s Day sale will mark the last chance to grab the iPhone 5 for $0 down. The offer, first announced back on April 10th is the same promotion T-Mobile highlighted this past Mother’s Day. The offer, which lasts through June 16th allows well-qualified customers to bring in their iPhone 4S or iPhone 4 devices to get the iPhone 5 for $0 down plus monthly payments. Depending on the value of their older iPhone 4 or 4S device, customers can also receive an extra credit of up to $120 good toward their monthly installments, existing T-Mobile bill, accessories or toward another device. Both new and existing qualified customers can take advantage of this trade-in offer. The end result being a “$0 down” net payment for customers and a decreased monthly payment of $15, down from $20 saving the customer $5 per month. More stores are instant trade in. If your phone meets those requirements you can get probably $300+ on eBay or Craigslist. Agreed. No reason to do this, unless you just don’t want to do the work to save more money. I’d rather deal with Mail in Rebates and have a sale on all phones much like they did last year. Not everyone has/wants an iPhone. ETA: And only “well qualified customers” are able to benefit from this sale. It’s ironic they spent years saying they didn’t need an iPhone & now they seem 90percent focused on this at the expense of everything else. But carriers – even the UN kind – always seem to be more concerned with new customers vs retaining their loyal ones. The lower prices often are just for new customers or activations. The existing base is taken for granted. On another issue, does anyone know what the plan rates are when you sign up for plans at a third party like Walmart? #2 Not everyone is a “well qualified” customer. I completely agree. Its crazy. Also, the IN STORE reps are SO worthless. They have no clue what they are doing. Its like a bunch of young 20 somethings w/ no degrees & no training. Try asking one of them about trading in a device for say, a GS4. Watch the clusterf*ck unfold. Unfortunately Mr. Galli I have to disagree, I run a store of very competent reps that work very hard for our customers on a daily. Don’t generalize one or two experiences you’ve had with our frontline reps to that of what everyone is going to get. I apologize for the service you received prior, and hope you give us in retail another shot. We are trying to change our way of doing business, and initially it wasn’t easy. Not all carriers. Sprint and T-mobile are notorious for giving deals for new customers but shafting the loyal customers. Verizon doesn’t give any discount to new customers at all. Everyone gets the same deal. I’m guessing there is no deal for people who have no iPhones to trade-in then? iPhone to me is like that girl that you’ve been wanting for so long but can’t never have, so you’d always just go for the next best thing. So is there a deal on the 32gb iphone or is this only for a 16gb? I agree totally, looks like they need to “refarm” their marketing dept. Just saying! We typically get huge turn out for these holiday promotions, hitting or exceeding the desired sales targets. No additional Marketing required. I’d think the turn out for this would be much greater if they weren’t offering just one device for the “sale”. I dont think they want more of a turn out :-) Some times the Return on the Investment diminish or are lost if too many folks take advantage of them. So if you want to buy a i5 on Fathers day with no trade in , you get shafted with the $149/down deal. Boy what a deal T-Mobile…. They seem to be obsessed with stealing ATT users but how many are going to be at the end of 2 year contracts this weekend, especially iPhone 5 owners who just signed up less than a year ago? That is why its 4 and 4s, which would likely be out of contract. The 4S owners wouldn’t be out of contract since it came out less than two years ago. It’s 629 full price without a trade in. It’s 360 if you trade in a 4 or 4s which means they give you rougly about 269 for your 4/4s on trade-in? maybe more if you get the bonus credit? That’s not entirely true. I did my 4 a few weeks after this started when the phone was still $579. I got $124 for it and it was in perfect condition and the rep said that was the most she had seen anyone get for the 4 so far. Cost me $23 to walk out with my 5 and there was no mention of the bonus credit. This sale doesn’t launch until June 14th. This sale has been going on since they launched the iphone . I considered this option when I got my Note 2. There is nor has there ever been an ‘extra’ credit. If you trade in your iPhone in good working condition, you get 100 (iPhone 5 down payment) plus up to an additional 120 based on the condition/model of the phone. The only real discount you get is that buying from T-Mobile is $75 cheaper than Apple. It is $19.01 cheaper than Apple. he is talking about when it first launched with the promotional price. which lasted the first 30 days. he is not talking about recently so his post is valid. effectively, this is a net discount on a iphone5 by foregoing the downpayment? Why would anyone want an iPhone anymore? They were great five years ago but the new Samsung S4 and HTC One phones are SO SO much better than the iPhone 5. I have an iPhone for work and the Samsung S4 for personal and the Samsung phone is so much better than the iPhone. Not everyone shares this sentiment. Did I say everyone shares that opinion? I think the answer is both simple and obvious, not everyone wants Android, or Windows Phone or BlackBerry. That’s a pretty easy thing to answer, no? So there was really no point to your original post! Why waste your time? You obviously are one of the sheeple that has an iPhone. As far as my original post I said iPhones have fallen behind Android phones in innovation and are no longer ahead or even at the level of Androids. Apple is now the follower and not the leader as they were when they originally came out with the iPhone. I’m a diehard Android fan and have run Cyanogenmod on all my phones but you’re wrong in some regards. The backup system, icloud, is leaps and bounds better than anything on Android and I wish we had it. Passbook is really something I’d really like to have and Siri is better at doing appointments and to-do lists than Google Now, even though Google now is faster and/or better than Siri on everything else. Iphone is simple and many people don’t want the learning curve of Android. Also, Apple is updating their Iphone 4 to IOS 7 this year. Can you name me one Android phone that will get Key Lime pie and was manufactured in 2010? Heck, name me one manufactured in 2010 that even got Ice Cream Sandwich. Yes, Android can do more, more customizable, and more options of sizes but Iphones have the lowest rate of warranty exchanges and don’t have the learning curve. I prefer Android but can understand non-tech people liking Iphones. Kakel Have you tried Assistant by speaktoit? I think it the app is a great competitor to Siri even before the introduction of Google Now. In fact, I prefer it in a lot of ways compared to google now and they update app quite regularly with improvements. Nexus S (pure google phone) was released late in 2010 and has been updated to Jelly Bean by Google itself (official). Honestly, most of 2010 phones are capable of running JB, it’s the carriers that would rather sell u a new phone then work on update for old models. One thing that Apple does well how they maintain control over the carriers and dictate /push updates to devices. I am sure Google will now do a job updating S4 & HTC One that are sold at Play Store. I think you need to step back and behind according to what? Behind according to whose definition of whatever you think they are behind in? I hate to constantly jump in here, but these kind of comments make me chuckle, Apple has never and will never claim to be first, they claim to be best which is again, subjective. Best at what? Best to whom? People who understand that about Apple don’t make these kind of comments. It sounds like you’re as much as a fan of Android as Apple fans are of Apple. That’s pot meeting kettle. Your original post said “Why would anyone want an iPhone anymore?”. This implies that you do think that everyone does share your opinion. I still prefer the Nokia. T-Mobile needs to hurry up with the 925 release already! It’s taking forever! Release the damn phone already! so no Father’s Day deals for any other phones? Trade in works on all phones. i know that. but that’s not a deal .. that’s how it works all the time regardless. i’m asking about Father’s Day deals on any other phone. will it be 0 down on others as well? i don’t know .. something. So I could walk in today and request this? I wouldn’t have to wait until Friday? This has been standard practice for nearly 3 months. Why would you trade in your iphone 4 or 4S for $120 when you can sell it for much more than that on Craigslist. I’m not sure about that. .
Is this something that is only valid on iPhones? Knowing how desperate T-Mobile wants iPhone customers I’m assuming it is but it would be nice if it is not. EDIT: Nevermind, I found the trade-in on T-Mobile’s site. 225 for my GS3 isn’t bad but its too bad I can’t walk in and trade my GS3 to get the GS4 or One for 0 down today. I’d do that in a heartbeat. I tried to get this offer on mothers day in Portland but the store could not do it because they can’t accept a trade in… Is there any chance it will work this time? Has anyone gotten this offer in pdx?? Please people, do not fall for this scam! Your phone is worth so much more. This is not a sell. I just sold my wife’s S3 on KSL for $300 in about 2 hours. T mobile offered $130 in trade. ?????? She bought the S4. I think T Mobile is done with Magenta Day Deals. Hmm… I do have another 4S somewhere in my desk. Looks like TMo dropped the prices on some of the Samsung phones as of today on their web site: Galaxy S4 @ $580, Note 2 @ $650, Galaxy S3 LTE @ $530. Don’t know if these are promotional prices or the new regular prices. I sure hope those are the regular prices now… Because I would totally grab an S4 for 99 down but I don’t have the money til the 1st. i hope they extend through the weekend and even drop another $50 or something off . perhaps this is another Father’s Day preview. While I hope these are new prices, I’m not holding my breath. Prices on T-Mobile’s website often fluctuate by about $50 in either direction. I have yet to find rhyme or reason to it. The Note 2 kind of made me laugh. It launched at $650, went up to $700 and is now back down to $650 where it started. All for a phone that came out 8 months ago. I guess since the Note 2 is the only phablet available on TMo, TMo can charge a higher price for it since there are no other phablet options. I’m hoping the Note 3 launches at <= $650. When I called in to see if they knew about the promotion. They said yes the down payment is $0 but there is no up to $120 additional credit. So therefore the trade in value is really just $150? Should show them the press release. Here it is from Engadget. I have been waiting for T-Mobile’s annual Father’s Day sale to refresh my family’s phones. None of us have iPhone! Nor do we want it! Where are the deals on the Android devices??? I am so disappointed! How lame. I can’t trade in a Samsung Galaxy SGH T959v to get an iPhone 5? Since TMO is pushing the iPhone, why not give the Android users a deal to trade in any Android phone for an iPhone 5 with 0 down. I would jump ship.